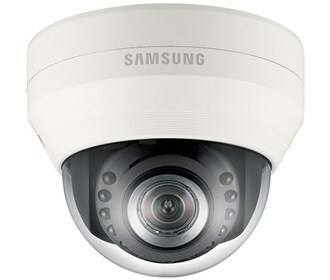 The Samsung B2B SND-5084R is a compact HD network day/night indoor dome camera. A minimum illumination of 0.05Lux makes the camera suitable for nighttime surveillance. It features 1.3 megapixel HD camera equipped with 2.8x varifocal lens, its varifocal lens maximizes the camera’s depth of field, focus, and image clarity. Featuring a Day & Night function it gives crystal-clear image quality under any lighting conditions. Built-in IR LEDs creates clear images even in the darkness. The SND-5084R features 2D/3D filtering noise reduction technology (SSNRIII) which offers color images in dimly-lit areas with reduced noise in the picture, thereby saving storage space. Including built-in SD/SDHC/SDXC memory slots it allows you to conveniently back up your surveillance footage. The Samsung B2B SND-5084R has many exciting features for users of all types. See the Samsung B2B SND-5084R gallery images above for more product views. The Samsung B2B SND-5084R is sold as a Brand New Unopened Item.